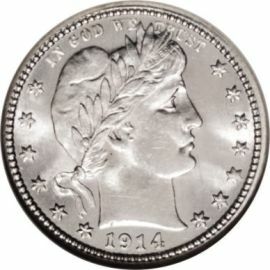 for their beautiful dollar designs, and Augustus Saint-Gaudens for his double eagle, that many say, is the most beautiful coin ever made. 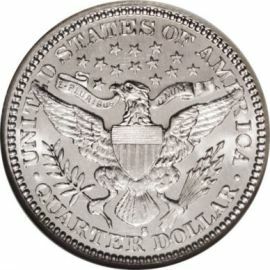 These silver coins feature a bust of Liberty similar in style to that of the Morgan Silver Dollar but facing right. She is wearing a Liberty cap topped with a laurel wreath, and a ribbon ties her hair in the back of her neck. The inscription above reads "IN GOD WE TRUST" and the date is found below. Six stars on the left and seven on the right represent the original thirteen colonies. The reverse was inspired by the Great Seal of the United States and depicts an eagle with spread wings, holding an olive branch with thirteen leaves in its right claw and a bundle of thirteen arrows in its left. The eagle holds a ribbon with the motto "E PLURIBUS UNUM" in its beak and thirteen stars are in the field above.